The Hotel Likoria opened in 1988 and has continually renovated and refurbished its 30 guest rooms and public spaces. 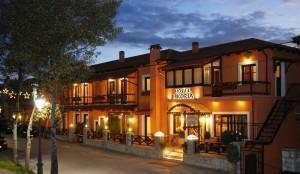 With excellent facilities and room amenities, this hotel is a very good choice for Arachova. The main areas of the hotel include a very pretty bar and breakfast area, fireplace in the lounge, reception area, roof garden during the summer months, and elevator at the reception. Electronic security locks have been installed in all rooms, most of which have private balcony, some overlooking the Delphi valley. Room amenities include central heating and air conditioning, mini bar, direct-dial telephone, color television, coffee/tea facilities, and private bath with shower, tub, and hairdryer. There are safe boxes at the reception, Wi-Fi Internet, wake-up service, and room service. Situated 250 meters from the main square of Arachova.